Some of the very fundamental questions about our existence – why we are here, what is out there, if we will ever find another planet similar enough to ours to live on – have come another step closer to being solved, today. The latest exciting Kepler Space Telescope planet-hunting discovery was announced by NASA this afternoon. 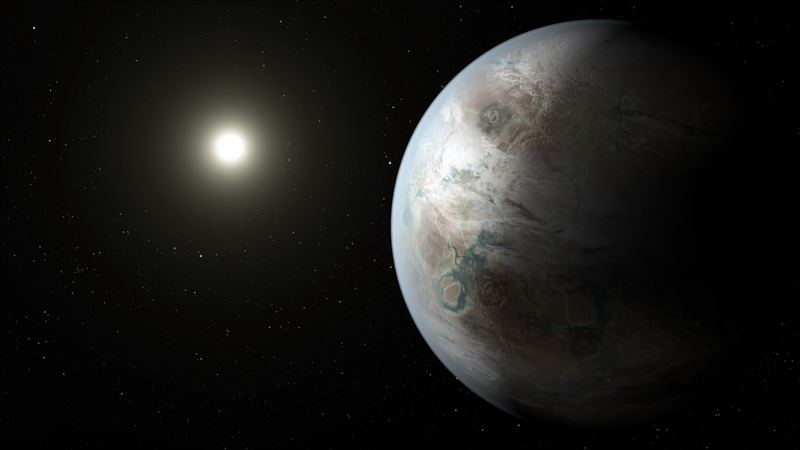 We now know that Earth has a very close cousin – an Earth 2.0 – since Kepler has discovered a new planet that is very similar to Earth, Kepler-452b. It was found in the habitable zone, orbiting its star, Kepler-452, which is similar in size and temperature to our own G2-type star – the Sun. This is the first time the combination has been found. Sometimes referred to as the “Goldilocks Zone”, the habitable zone is a range of distance where a planet resides that is not too far from and not too close to the star it orbits. This would keep its temperature in the perfect range allowable for water to remain in a liquid state and possibly collect over the surface of the planet. 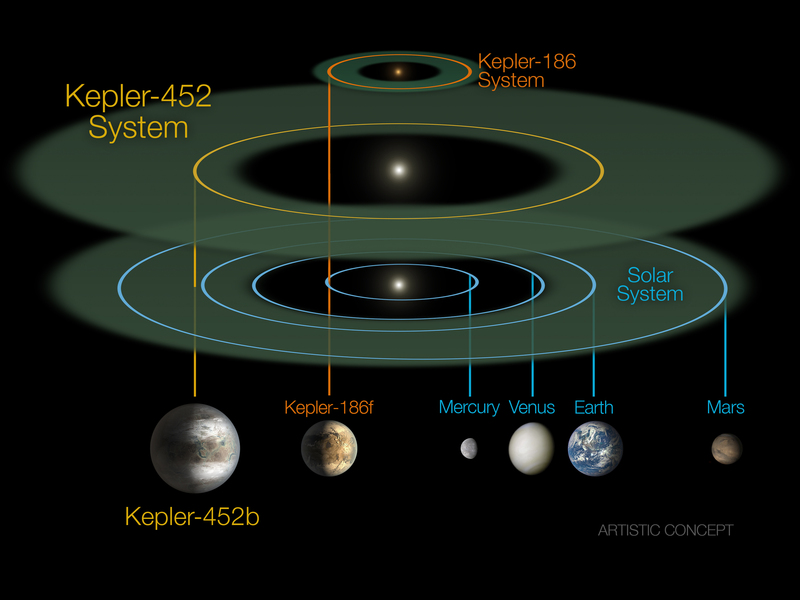 Previously, Earth-like planets had been discovered in the zone, but the combination of factors surrounding Kepler-452b’s existence had yet to be found, until now. There are some interesting facts that have already been uncovered about this new cousin of Earth. The planet resides in the constellation of Cygnus, a mere 1,400 light-years in distance. It takes 385 days to orbit its star – only 5 percent longer than our own orbit of our star, despite it being 60 percent larger in diameter than Earth. Due to its size in comparison with Earth, it is classified as a “super-Earth-size”. The composition and mass of the planet have yet to be known, but if we look at research done on planets of similar size, we can infer that it has a good chance of being rocky in its make-up. Kepler-452b’s parent star, Kepler-452 is 5 percent further away than the Sun is from Earth, and at 6 billion years old, it is 1.5 years older than the Sun. While its temperature is the same as that of the Sun, it is 20 percent brighter and has 10 percent larger in diameter. John Grunsfeld, Associate Administrator for NASA’s Science Mission Directorate in Washington, mentioned today that when he was growing up, he would look up at the sky and ask himself if there are planets around the stars. Today, we know factually, that many exist, and some are probably like our own blue marble. This is just the beginning of many more thrilling discoveries that will happen in the years to come! Sherry is extremely passionate about promoting Science, Technology, Engineering and Mathematics (STEM) education, especially for girls. She enjoys helping students feel empowered and confident in themselves. She is the Director of Education for an education company and her fascination with space started when she was a kid. She loves getting kids, and anyone willing to listen, excited about it through her writing and photography. Sherry is currently in the process of writing a children’s book that she hopes will be successful enough to eventually expand into a series.